I would like to share something different with you and it's a product that I've been using for a few years. Most of us are probably doing housework from time to time but when you have allergies or sensitivities it can be a tricky to find cleaning products that don't trigger reactions. 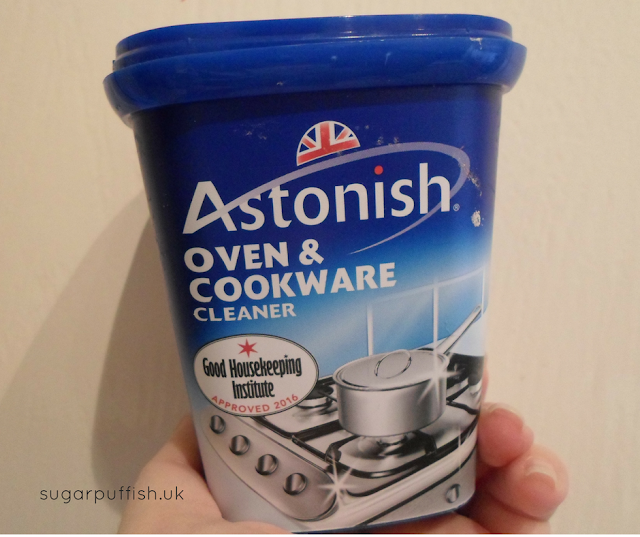 Astonish Oven & Cookware cleaner is made from vegetable soap, costs under £2 for a 500g tub and works miracles on ovens and around the home. It is very simple to use. You scoop the desired amount from the tub and using a damp cloth scrub the area and then wipe clean. I use this on my oven but I have also found it great for the bathroom. If you use oil based cleansers and get a dirty tide mark on the sink then the Atonish cleaner removes it with ease. Astonish products are Vegan and cruelty free which is fantastic because household items are still subject to testing. The oven cleaner doesn't contain a cocktail of questionable ingredients which makes me feel more at ease using around the home. Some oven cleaners take your breathe away with a noxious scent which can be overwhelming when scrubbing surfaces especially in a confined space like the oven. You can purchased Astonish Oven & Cookware cleaner at Lakeland, Robert Dyas or visit the Astonish website to find more stockists.